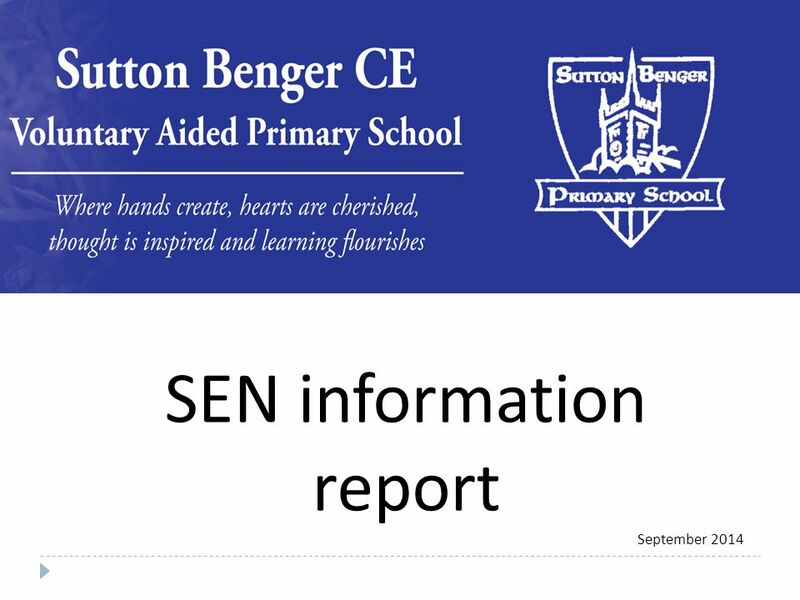 SEN information report September 2014. What does Sutton Benger offer for the well being of my child? Who makes the decisions about how much support my. 2 What does Sutton Benger offer for the well being of my child? Who makes the decisions about how much support my child receives? 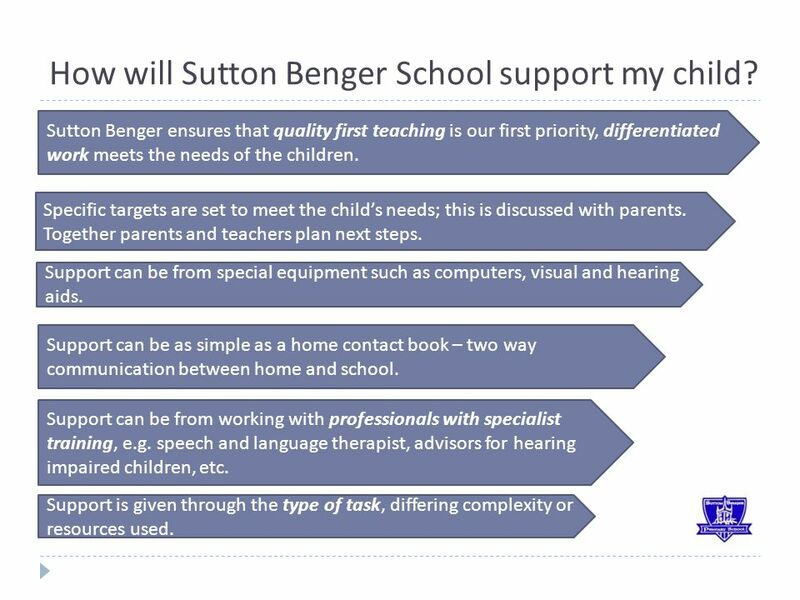 How will Sutton Benger support my child? 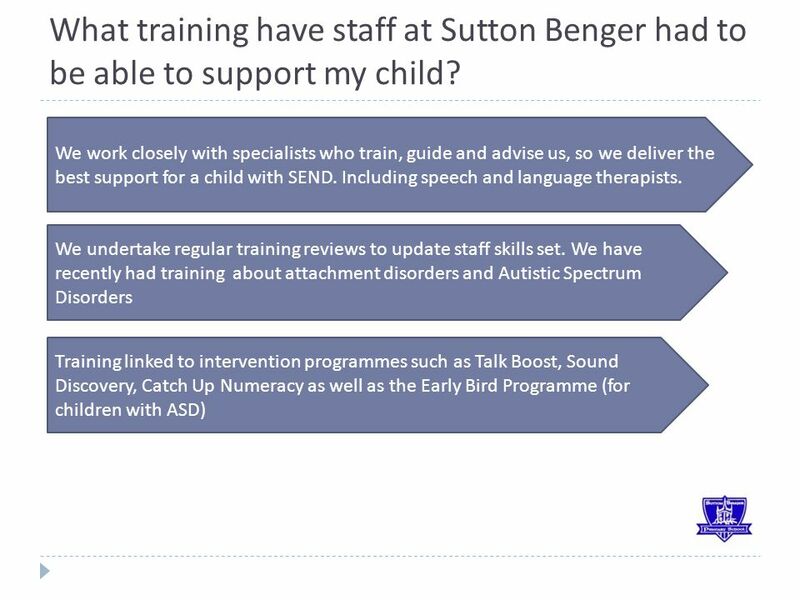 What training have staff at Sutton Benger had to be able to support my child? How will my child be included in activities outside the classroom, including trips? 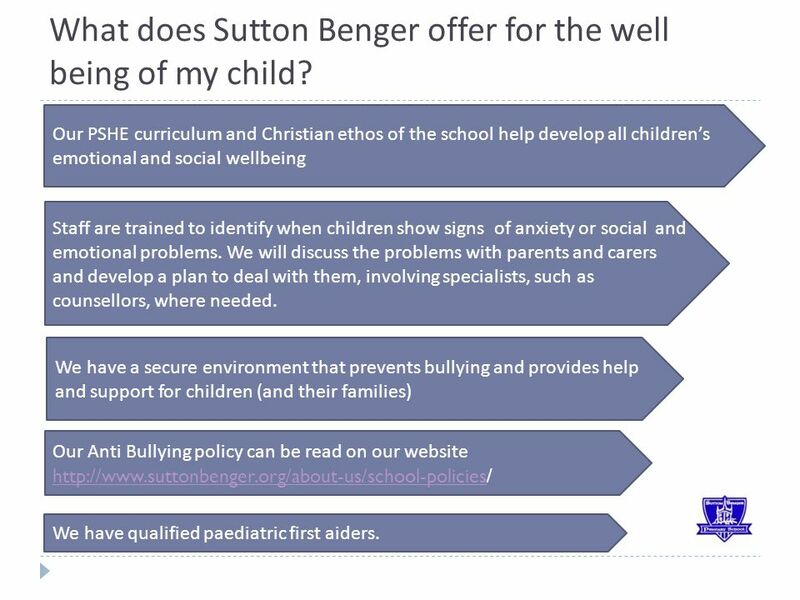 How does Sutton Benger know that my child needs extra help? 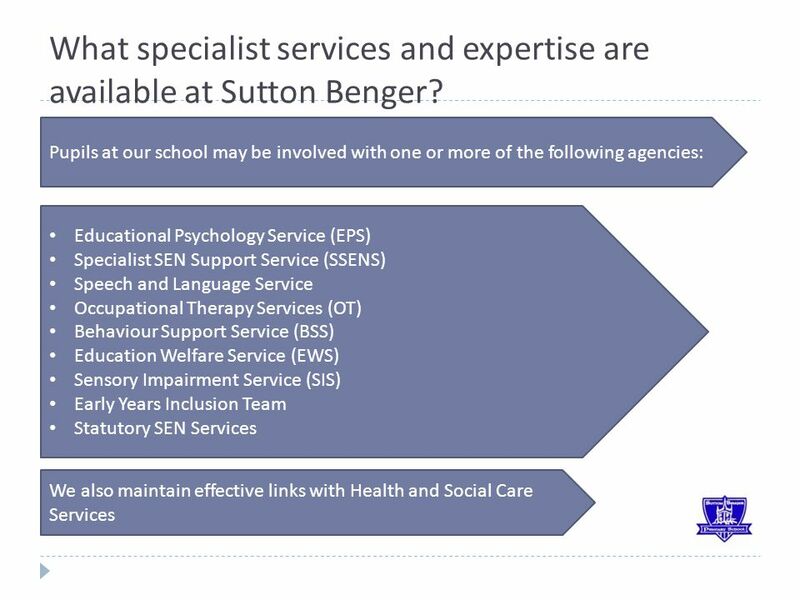 What specialist services and expertise are available at Sutton Benger? 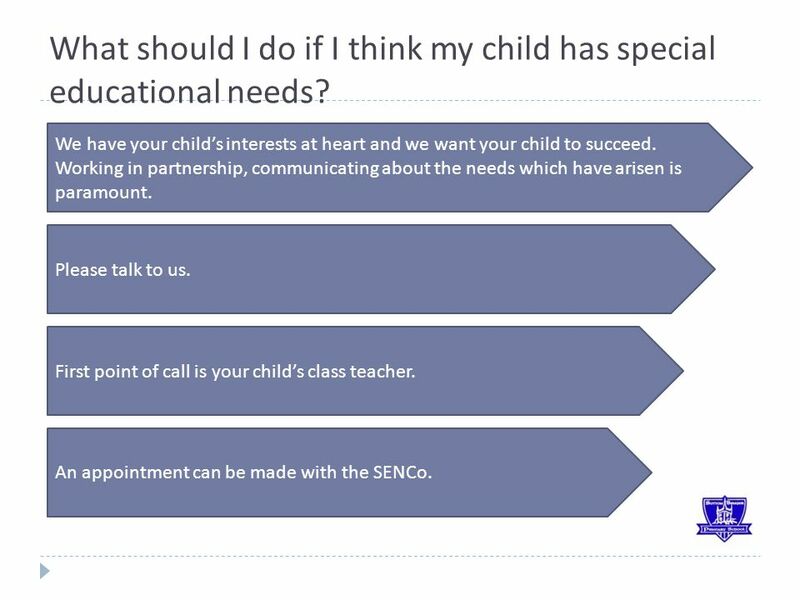 What should I do if I think my child has special educational needs? 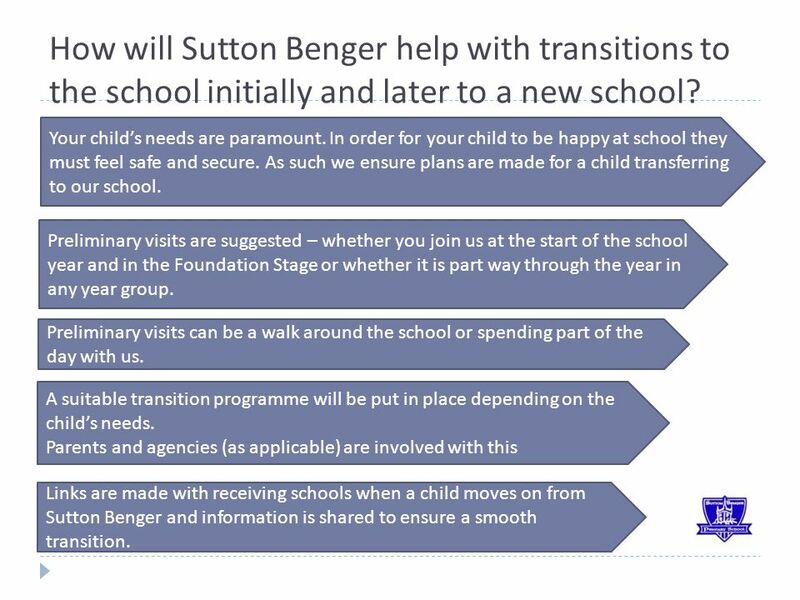 How will Sutton Benger help with transitions to the school initially and later to a new school? 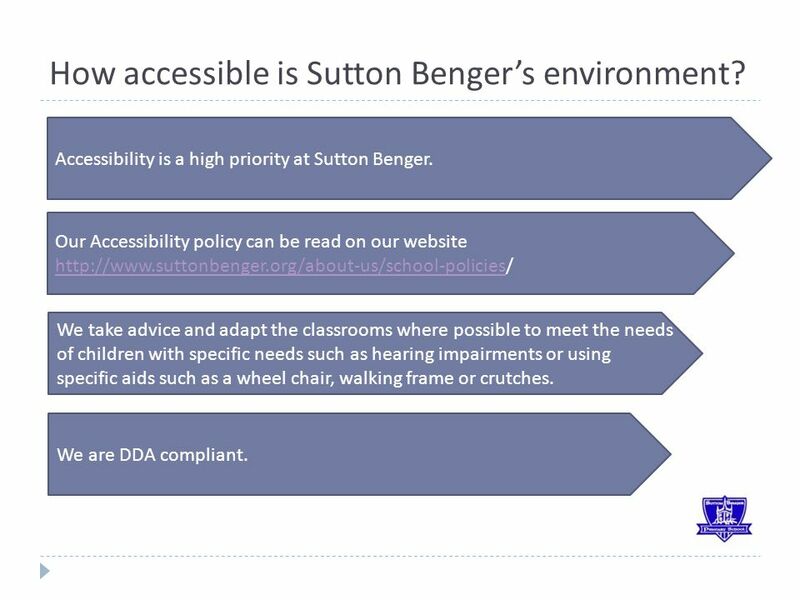 How accessible is Sutton Benger’s environment? What curriculum will my child be taught? 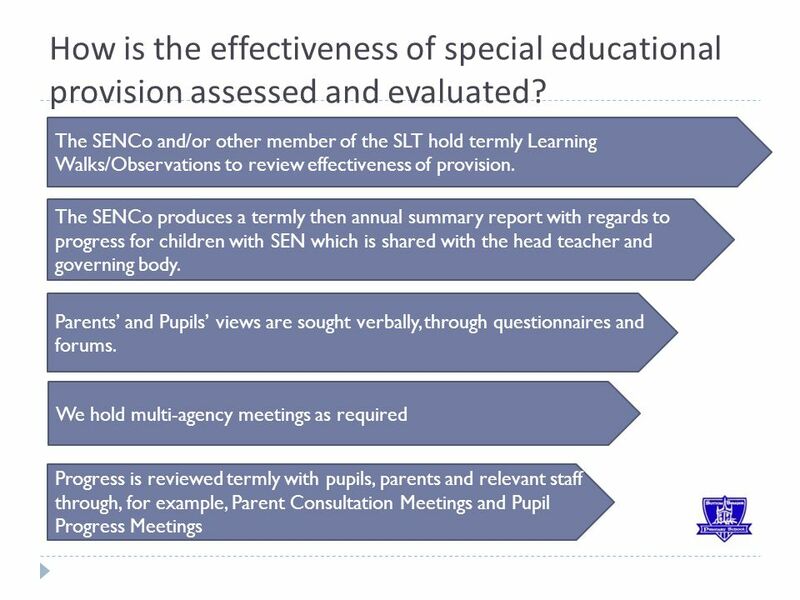 How is the effectiveness of special educational provision assessed and evaluated? 4 How will Sutton Benger School support my child? Support can be from special equipment such as computers, visual and hearing aids. Support can be as simple as a home contact book – two way communication between home and school. Support can be from working with professionals with specialist training, e.g. speech and language therapist, advisors for hearing impaired children, etc. Support is given through the type of task, differing complexity or resources used. Specific targets are set to meet the child’s needs; this is discussed with parents. Together parents and teachers plan next steps. Sutton Benger ensures that quality first teaching is our first priority, differentiated work meets the needs of the children. 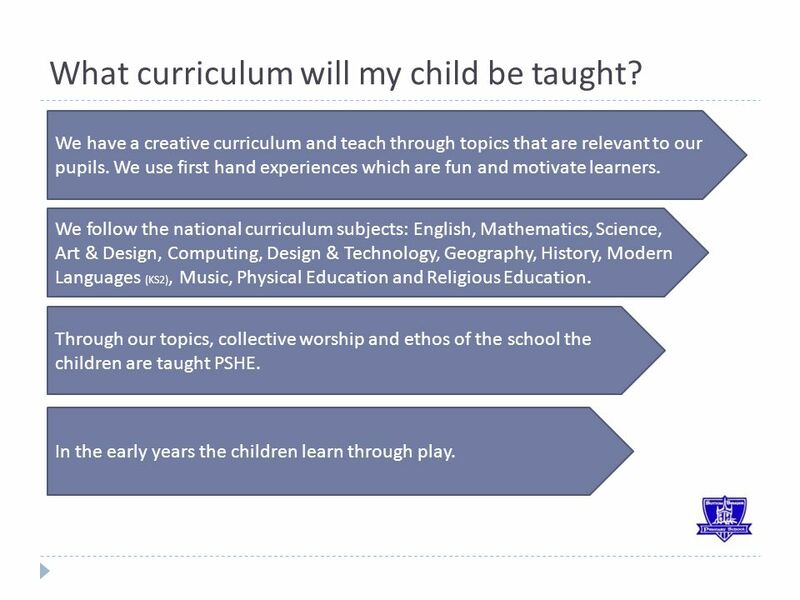 6 What curriculum will my child be taught? We have a creative curriculum and teach through topics that are relevant to our pupils. We use first hand experiences which are fun and motivate learners. In the early years the children learn through play. Through our topics, collective worship and ethos of the school the children are taught PSHE. We follow the national curriculum subjects: English, Mathematics, Science, Art & Design, Computing, Design & Technology, Geography, History, Modern Languages (KS2), Music, Physical Education and Religious Education. 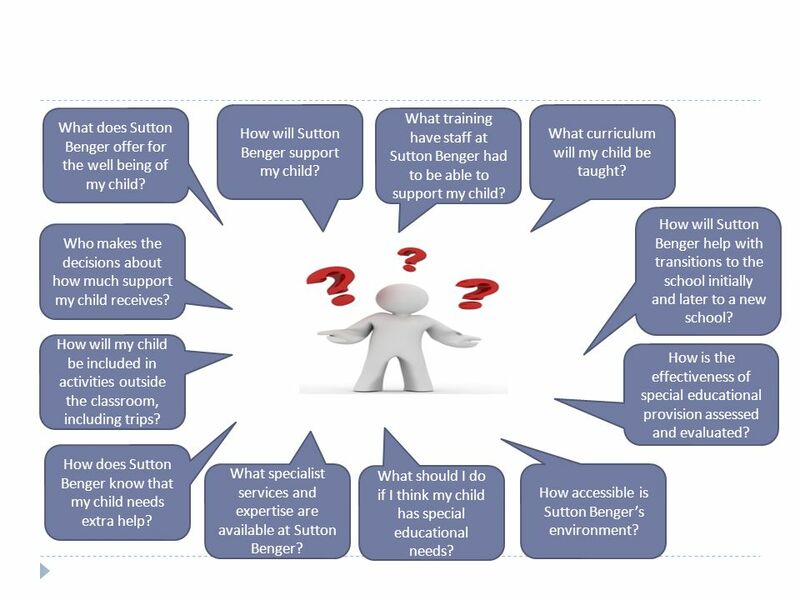 8 How will Sutton Benger help with transitions to the school initially and later to a new school? Your child’s needs are paramount. In order for your child to be happy at school they must feel safe and secure. As such we ensure plans are made for a child transferring to our school. A suitable transition programme will be put in place depending on the child’s needs. Parents and agencies (as applicable) are involved with this Preliminary visits can be a walk around the school or spending part of the day with us. Preliminary visits are suggested – whether you join us at the start of the school year and in the Foundation Stage or whether it is part way through the year in any year group. Links are made with receiving schools when a child moves on from Sutton Benger and information is shared to ensure a smooth transition. 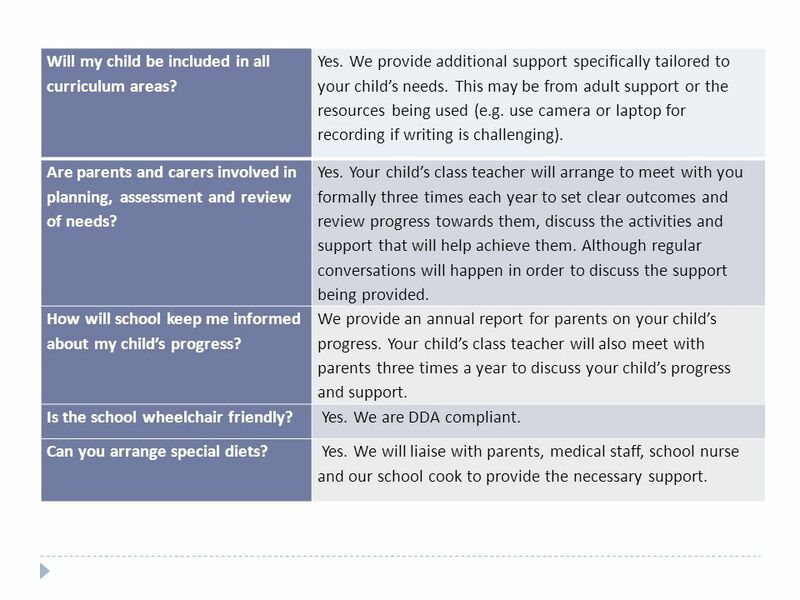 9 What should I do if I think my child has special educational needs? We have your child’s interests at heart and we want your child to succeed. Working in partnership, communicating about the needs which have arisen is paramount. Please talk to us. First point of call is your child’s class teacher. An appointment can be made with the SENCo. 11 How does Sutton Benger know that my child needs extra help? Special educational provision is beyond the differentiation provided by high quality personalised teaching. The provision is additional or different from that made generally for others of the same age. Assessment for learning is the process to gain essential information on abilities, progress and achievements of all individual pupils.  How a child achieves during lessons  Marking of work  Termly formal and informal tests  Reviewing strengths, needs and experiences  Ongoing assessment in all areas The SEN flow chart depicts how support and involvement is increased / decreased depending on assessment and attainment. 12 How will my child be included in activities outside the classroom including trips? We want all our pupils to benefit from the education we offer. This is the same with trips. Where it is beneficial for a parent to participate alongside their child with SEND we will approach the parents at the planning stage. 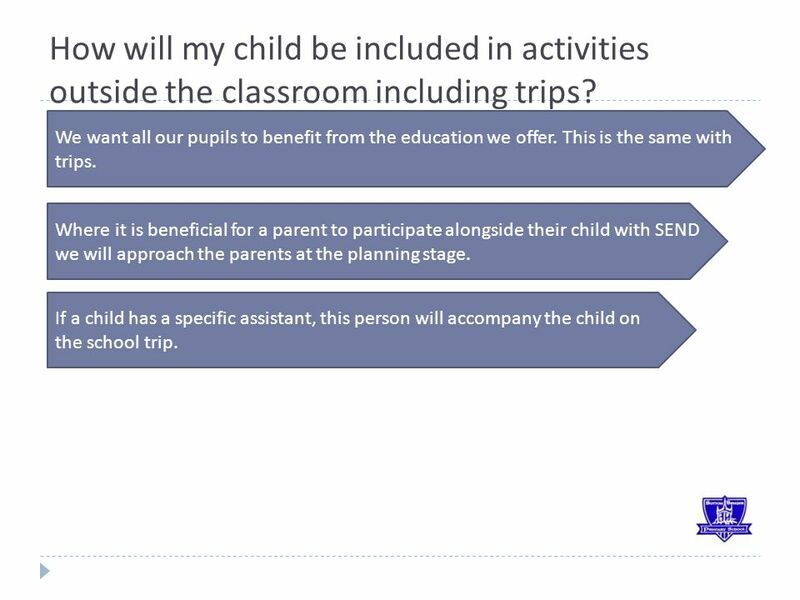 If a child has a specific assistant, this person will accompany the child on the school trip. 13 Who makes the decision about how much support my child receives? When pupils enter our school the SENCo will note any SEN identified and seek to liaise with previous schools / settings / parents. 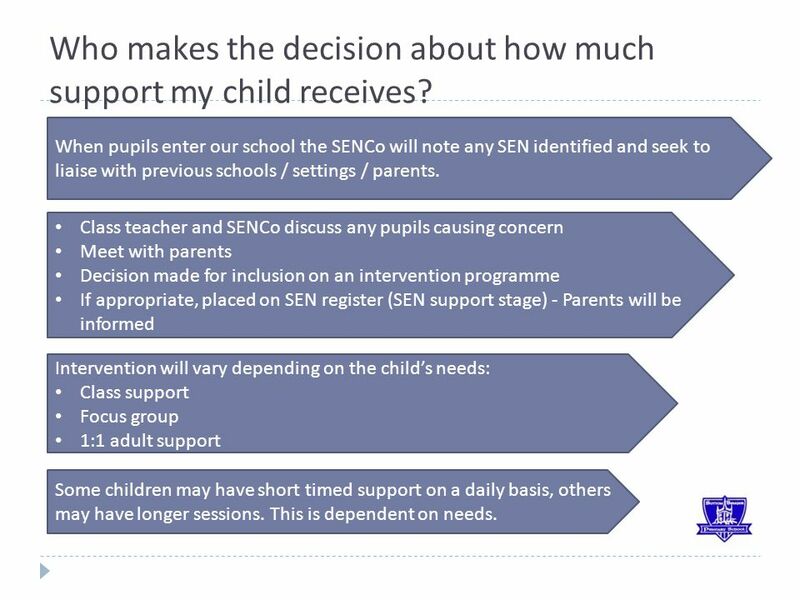 Class teacher and SENCo discuss any pupils causing concern Meet with parents Decision made for inclusion on an intervention programme If appropriate, placed on SEN register (SEN support stage) - Parents will be informed Intervention will vary depending on the child’s needs: Class support Focus group 1:1 adult support Some children may have short timed support on a daily basis, others may have longer sessions. This is dependent on needs. 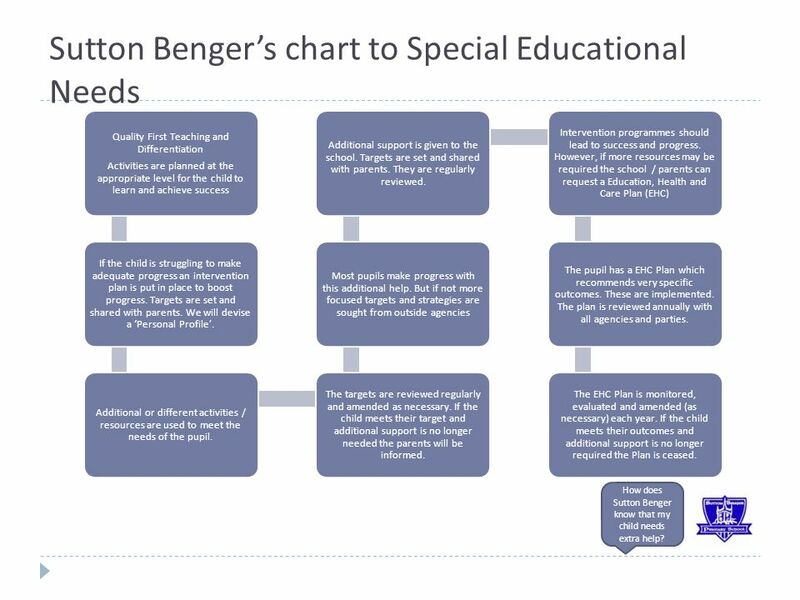 15 Sutton Benger’s chart to Special Educational Needs How does Sutton Benger know that my child needs extra help? Quality First Teaching and Differentiation Activities are planned at the appropriate level for the child to learn and achieve success If the child is struggling to make adequate progress an intervention plan is put in place to boost progress. Targets are set and shared with parents. We will devise a ‘Personal Profile’. Additional or different activities / resources are used to meet the needs of the pupil. The targets are reviewed regularly and amended as necessary. If the child meets their target and additional support is no longer needed the parents will be informed. Most pupils make progress with this additional help. But if not more focused targets and strategies are sought from outside agencies Additional support is given to the school. Targets are set and shared with parents. They are regularly reviewed. Intervention programmes should lead to success and progress. However, if more resources may be required the school / parents can request a Education, Health and Care Plan (EHC) The pupil has a EHC Plan which recommends very specific outcomes. These are implemented. The plan is reviewed annually with all agencies and parties. The EHC Plan is monitored, evaluated and amended (as necessary) each year. If the child meets their outcomes and additional support is no longer required the Plan is ceased. 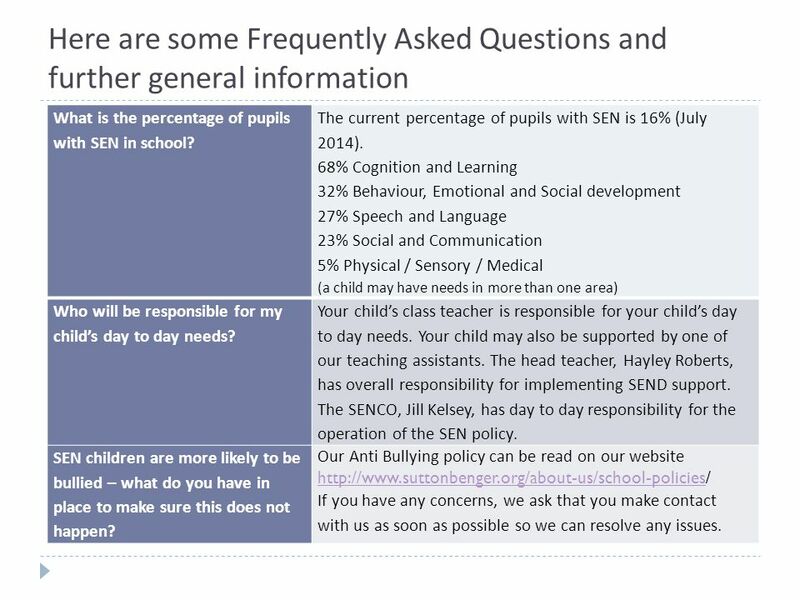 16 Here are some Frequently Asked Questions and further general information What is the percentage of pupils with SEN in school? The current percentage of pupils with SEN is 16% (July 2014). 68% Cognition and Learning 32% Behaviour, Emotional and Social development 27% Speech and Language 23% Social and Communication 5% Physical / Sensory / Medical (a child may have needs in more than one area) Who will be responsible for my child’s day to day needs? Your child’s class teacher is responsible for your child’s day to day needs. Your child may also be supported by one of our teaching assistants. The head teacher, Hayley Roberts, has overall responsibility for implementing SEND support. The SENCO, Jill Kelsey, has day to day responsibility for the operation of the SEN policy. SEN children are more likely to be bullied – what do you have in place to make sure this does not happen? Our Anti Bullying policy can be read on our website http://www.suttonbenger.org/about-us/school-policieshttp://www.suttonbenger.org/about-us/school-policies/ If you have any concerns, we ask that you make contact with us as soon as possible so we can resolve any issues. 17 Will my child be included in all curriculum areas? Yes. We provide additional support specifically tailored to your child’s needs. This may be from adult support or the resources being used (e.g. use camera or laptop for recording if writing is challenging). Are parents and carers involved in planning, assessment and review of needs? Yes. Your child’s class teacher will arrange to meet with you formally three times each year to set clear outcomes and review progress towards them, discuss the activities and support that will help achieve them. Although regular conversations will happen in order to discuss the support being provided. How will school keep me informed about my child’s progress? We provide an annual report for parents on your child’s progress. Your child’s class teacher will also meet with parents three times a year to discuss your child’s progress and support. Is the school wheelchair friendly? Yes. We are DDA compliant. Can you arrange special diets? Yes. We will liaise with parents, medical staff, school nurse and our school cook to provide the necessary support. 18 What is a ‘personal profile’ sheet? A one-page profile gives a shared understanding about your child, built from the knowledge of the child, the family and friends and teaching staff. They give parents an opportunity to share their learning and expertise on what good support means for their child, and what is important to them. It is these ‘little things’ that make a huge difference. What is a target sheet? 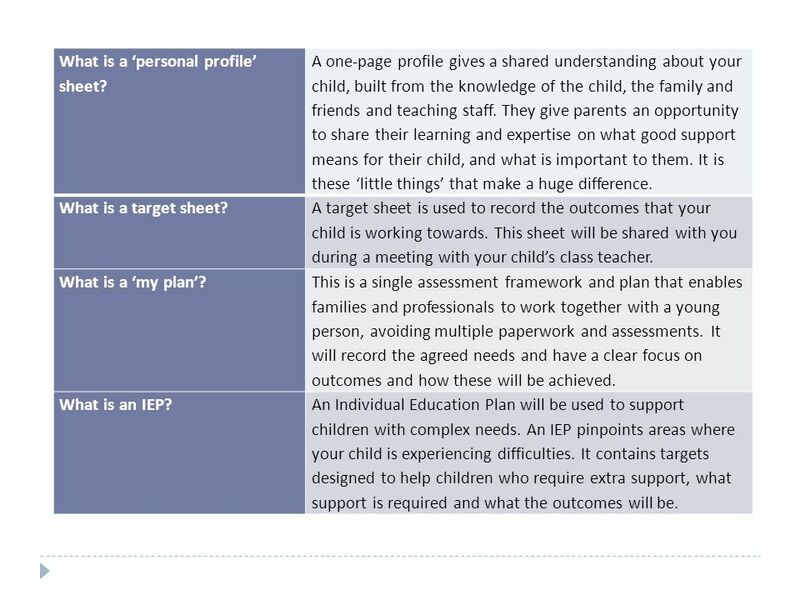 A target sheet is used to record the outcomes that your child is working towards. This sheet will be shared with you during a meeting with your child’s class teacher. What is a ‘my plan’? This is a single assessment framework and plan that enables families and professionals to work together with a young person, avoiding multiple paperwork and assessments. It will record the agreed needs and have a clear focus on outcomes and how these will be achieved. What is an IEP?An Individual Education Plan will be used to support children with complex needs. An IEP pinpoints areas where your child is experiencing difficulties. It contains targets designed to help children who require extra support, what support is required and what the outcomes will be. Download ppt "SEN information report September 2014. What does Sutton Benger offer for the well being of my child? Who makes the decisions about how much support my." Our Local Offer for SEN. SEN At Priorslee Primary Academy we strive to support all children to enable them to achieve potential. In order to do this many. Working with HLTAs/TAs Dr John Woollard SEND Day 2015. Academy Core Offer Academy Core Offer – See SEND Policy on our website Interventions for all students – All students are assessed and reviewed half- termly. St Paul’s Special Educational Needs Offer *On the following pages you will be able to find out what we can offer the pupils and families in our school.